We are also pleased to have an exhibit in collaboration with our neighbor, Writers & Books. The photographs coincide with the reading of the book Queen of the Fall by Sonja Livingston, as part of the "If all Rochester Reads the Same Book" series. Plan to attend First Friday Gallery Night on March 4 from 5 to 9 pm. This reception is a great opportunity to view the art, discuss it with the attending artists, and to invest in their photographs. 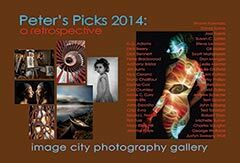 Click Here to see our webpage for show details and a preview of photographs in the exhibit. After the installation of the photographs in the current show we selected two of our favorites by featured and Guest Photographers and wrote commentary on what appealed to us in making the choices. 53 Studebaker by Michael Lempert -- The front seat view of a 1953 Studebaker by Michael Lempert resonates strongly with old timers and lovers of classical cars. 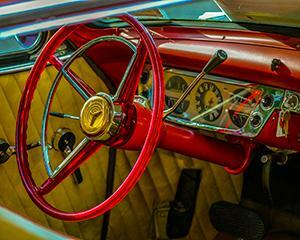 The red steering wheel appears to pop forward from the receding more mundane yellow-tan of the upholstery producing a three dimensional perception for the viewer. By shooting from an angle Michael is able to create the impression of being in the front seat while leaving the details of the horn ring, gear indicator, gear handle, and control panel observable. He has placed the steering wheel in a perfect rule of thirds position enabling our eyes to migrate from left to right clearly exposing the control and indicator panel before finishing with keys in the ignition switch. The photograph produces a strong sensation of depth which enables viewers to imagine themselves sitting in the front seat and handling the controls. A warm nostalgic feeling is felt by those who remember the cars of the fifties. Michael's use of vivid colors further promotes the overall emotional feeling. For those who actually remember the introduction and short life of the controversial "Bullet Nose" model of the "Studebaker" of the fifties, feelings pro and con must abound. Moroccan Blue #8 by Steve Levinson -- Steve Levinson has created a thoughtful, coherent and intriguing body of work documenting a recent trip that he and his wife took to Morocco. During a visit to the city of Fez, founded about 800 AD and is the site of the world's oldest university, their guide took them to a part of the old city. Rather than step back and take general 'snap shots' of the homes and businesses in the district, Steve selected a more intimate and minimalist method to take the viewer on his tour. This old section of Fez is an urban area that is striking in its primary colors of white, brown earth tones and Morocco Blue. It appears as if the area is uninhabited; no litter can be seen, no bicycles or other modes of travel are evident and no people or animals with an exception of a car, are in the passageways. And yet, the vibrant colors, the architecture, and the intricate designs bespeak a structured, ordered and vibrant society. Lines are sharp and distinct; there are very few curves or soft edges. Taken in mid-day, the dark shadows thrown by the sun's rays add to the orderly structure of the city. Walks are narrow, since this is one of the world's largest car-free urban areas. Morocco Blue #8 summarizes Steve's exhibit. The walls surrounding the entrance appear massive, and though the door is closed there is a metal ring on the door inviting the visitor to knock and seek admittance. The human scale height of the blue on the lower part of the building blends well with the earthen wall and steps leading to the door. Since this is a desert area, very little, if any wood is in evidence. More evidence of the climate is seen in the pure white paint on the upper portions of the building to reflect the intensity of the sun. The terracotta tiles on the awning over the door are likely duplicated on the roof. The intricate design of the metal over the window and the accompanied painting on tiles next to it, along with a crest of arms by the door, is evidence an advanced and artistic culture. An apparent electric wire below the window, and what looks like a light at the top of the door jam is the hint of modernity in this otherwise ancient urban area. 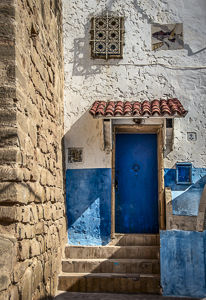 Steve has assembled an excellent collection of photos that pique our interest in the culture and society that Steve visited and as with the door in Morocco Blue #8, we wonder about the inner workings of such an ordered, though artistic society. The fee for this course is only $280! $100 non-refundable deposit is due by March 1st, 2016. The balance is due by the first day of class. There will be a maximum of 10 students. 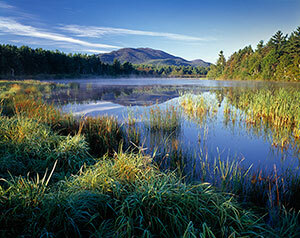 A high percentage of successful landscapes have three components: a foreground, a middle ground, and a background. Foreground is the most important element for communicating depth in photographs. During sunrises and sunsets interesting foregrounds are difficult to achieve because they are usually backlit and often dark when shooting directly into the sun. Like in last month's photo tip, a photographer shooting at approximately a right angle to the sun can use attractive side lighting to bring out the beauty of a sunrise or sunset. My Lake Everest Sunrise photograph was actually captured about thirty minutes after the sunrise. At that moment in time it was the "play of light" on the foreground that most attracted me to shoot the photograph. I found that my best composition and best side lighting occurred when I set my camera at about 110 degrees from the rising sun. Although the reflections of the mountain in the lake and the clouds in the sky were attractive, it was the "play of light" on the grasses and reeds that I found most interesting emotionally. Therefore, I emphasized the foreground by making it about two/thirds of the overall scene. Note that the far side of the lake acts as the middle ground, and the attractive clouds over the mountain provide the background. By emphasizing the play of light on the foreground and then also including the middle and back-grounds, a feeling of depth is communicated. The beauty of the "play of light" provides the emotional impact that separates it from more traditional sunrise images. The see a larger image and the full series of Gary's Photo Tips, check this link.